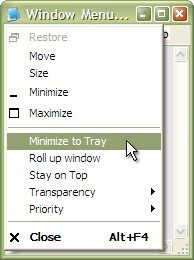 Actual Window Menu 4.5 is shell tools software developed by Actual Tools. Actual Window Menu was made specially for organizing windows in a neat way. Ease work with new tools which can be triggered via additional commands in the standard menu. Apply any settings to one application or to all of them and change settings at any time! It will help you work simultaneously with several applications (Send to Bottom, Stay on Top, Make Transparent, Roll Up functions) or set position for windows (Align window). Try it now! This program is shareware, which means you can download and use Actual Window Menu 4.5 for free during 30-days trial period. After this period you gonna have to buy Actual Window Menu 4.5 software for $19.95 or uninstall the program. Actual Window Menu 4.5 supports English, German, Russian, French, Spanish interface languages and works with Windows 98/XP/Vista. We have tested Actual Window Menu 4.5 for spyware and adware modules. The software is absolutely safe to install. We has completely tested shell tools software Actual Window Menu 4.5 many times, written and published the interesting article and uploaded installation file (3202K) to our fast server. Downloading Actual Window Menu 4.5 will take minute if you use fast ADSL connection.